The Watershed Conservation Resource Center (WCRC) worked with project partners to restore Mullins Branch, on the University of Arkansas Campus in Fayetteville, AR. 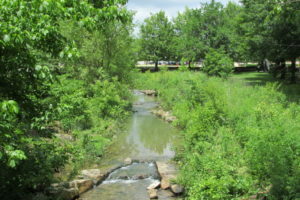 An urban stream restoration plan was designed and implemented to reduce sediment erosion and The project was funded by an EPA Section 319(h) grant administered by the Arkansas Natural Resources Commission with matching funds provided by the City of Fayetteville and the University of Arkansas. The project was initiated in January 2011, and implementation of the stream restoration plan began in July 2012 and was completed in August 2012. Mullins Branch flows to Town Branch which is a tributary to the West Fork White River (WFWR). The WFWR converges with the White River, which eventually forms Beaver Lake, the primary drinking water source for over 400,000 people in Northwest Arkansas. The Arkansas Department of Environmental Quality placed portions of both the WFWR and the White River on the 1998 State 303(d) list of impaired waterways citing sedimentation and turbidity issues as a result of surface erosion, which includes streambank erosion, as the cause. The project reach consists of a 1,000 foot stretch of Mullins Branch located on campus of the University of Arkansas in Fayetteville, AR. The site was identified for restoration as part of a nutrient reduction plan developed by Geosyntec Consultants for the City of Fayetteville. Erosion of the streambank contributes nutrients to the waterway, potentially increasing the water treatment costs for human consumption. The WCRC utilized natural channel design principles to reduce streambank erosion and sediment loads. The design implementation included critically placed rock structures that deflect flow away from the banks and improved riffles and pool features along the stream channel. These features increased pool habitat and water and aeration within the system, which results in better assimilation of nutrients into the ecosystem. The use of native vegetation is a critical component of the stabilization design. Soil mattresses, a soil layer consisting of topsoil wrapped in a coconut fiber blanket, were constructed in benches to minimize floodplain erosion during vegetation establishment. The soil layer provides a medium for plants to take root and grow and provide additional weight to secure the trees used in the structure. The soil mattresses or lifts were seeded with a mix of native riparian seed types. The stream corridor was also re-vegetated with native grasses, shrubs, and trees. As the plants continue to mature, they will help to bind the soil through root growth and reduce scour of the banks along the channel. They will also aid in dissipating water velocity and act as a buffer to improve the removal of pollutants as the leaves, branches, and stems of the plants interact with runoff and rainfall events. A team of volunteers has been assembled to regularly evaluate the condition of the site to help direct maintenance and repairs of the project, as needed. Copyright © 2019 Watershed Conservation Resource Center. All Rights Reserved.